Dedicated to finding alternatives to mainstream architectural practice, the Ant Farm combined video, performance, and sculpture—achieving widespread notoriety in the mid ’70s for such projects as the Cadillac Ranch public art installation in Texas, and the spectacular performance art event Media Burn. “It was a very different time,” said Lord. “I graduated from Tulane School of Architecture in 1968 and there was revolution in the air." Inspired by such creative thinkers as Buckminster Fuller and Paulo Soleri, the Ant Farm collective spent its early years creating an alternative architecture designed for a nomadic lifestyle. They built giant inflatable structures—cheap and easy to assemble—in opposition to the mainstream Brutalist architecture of the ’60s that emphasized permanent reinforced concrete. This led to The Truckstop Network, a freewheeling 1970 tour of colleges and universities in the Ant Farm’s “Media Van,” which was equipped with a video portapack, as well as an Eisenhower-era trailer, complete with an inflatable solar-heated shower unit. “We brought an interest in high technology to the nomadic counterculture,” Lord observed. The Ant Farm completed a number of successful architectural commissions in the early ’70s, including the award-winning House of the Century in Angleton, Texas. But the collective also spent time exploring the potential power of video and performance art. This culminated in Media Burn, a dazzling event (captured on a widely distributed videotape) that featured two collective members dressed like astronauts, who drove a customized 1959 Cadillac El Dorado—outfitted with interior video communication—at full-speed through a pyramid of flaming TVs in the parking lot of San Francisco’s Cow Palace on July 4, 1975. But perhaps the Ant Farm’s most famous endeavor was Cadillac Ranch, the art installation along Route 66 (now Highway 40) in Amarillo, Texas, that was immortalized in song by Bruce Springsteen. Commissioned by Stanley Marsh 3, Lord and his Ant Farm partners partially buried 10 Cadillacs nose down in a wheat field--both celebrating the evolution of the Cadillac’s tailfin and at the same time mocking Detroit carmakers’ history of planned obsolescence. 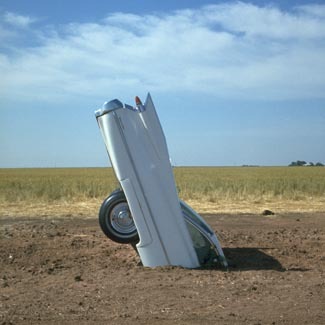 Within six to eight months, images of Cadillac Ranch had appeared in People and Esquire magazines. Soon, articles began popping up everywhere and people began to make pilgrimages, often scratching their names in the paint of one of the cars. Over the past three decades, the image of Cadillac Ranch has been used—with or without permission—by dozens of companies advertising everything from automobiles and insurance to restaurants and computers. Possibly the best-known public artwork in the country, Cadillac Ranch is seen by an estimated 300,000 people each year as they motor down the Texas highway. When a fire in their San Francisco studio destroyed much of their work, the Ant Farm disbanded in 1978. Lord eventually moved on to become an assistant professor of visual art at UC San Diego. 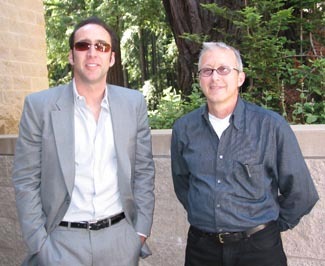 He came to UCSC in 1988 and was chair of the Film and Digital Media Department from 2003-07. “It was a hard transition for me after the Ant Farm ended,” Lord noted. “But I liked being in an environment of creative collaboration, so teaching appealed to me. The Ant Farm was my graduate education—my M.F.A. equivalency was established through life experience,” he added. Chip Lord will be honored the evening of June 3rd from 5 to 9 p.m. as part of a two day Film Symposium presented by the UC Santa Cruz Arts Division titled “Bridging the Gap.” On Saturday, June 4, panel discussions will explore topics such as “The Business of Film, Media and Social Change,” and “Getting Started in Television.” Film screenings will include innovative works by alums, faculty and guests. For more information and/or to register for this free event, go to Bridging the Gap.